How smart are smart notebooks (not laptops, notebooks)? And what are the benefits of smart notebooks compared to standard notebooks? These are some of the questions we'll try to answer in this article. Here, you will also find the list of ten best smart notebooks and a review of each particular product. In any case, stick around if you would like to make a shift from standard to reusable and environmentally friendly digital notebooks. What is the Best Smart Notebook to Buy in 2019? The Rocketbook Smart Notebook is trendy, reusable and versatile. You can buy it in four different colors, and choose between two sizes, Letter, and Executive. The Rocketbook Notebook arrives with Pilot FriXion pen. Note that can also buy Pilot FriXion markers and highlighters and use them with this smart notebook. 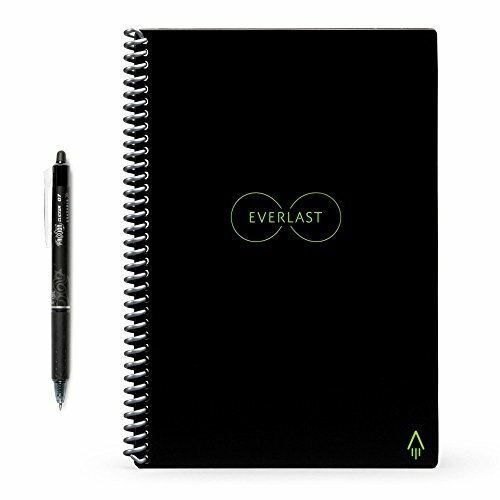 The notebook features 36 reusable and easy to erase pages. For wiping, simply use an included cloth (make sure that it is damp) and then start deleting the content. For writing, you should wait at least 15 seconds for the paper to absorb the ink. This notebook works together with the Rocketbook app. When you open it, you'll notice that this notebook has very clear and easy-to-spot borderlines. You'll also see a QR code at the bottom left or right corner. These design options were implemented to ensure that the Rocketbook app can easily spot and read your notes. This notebook merges cloud scanability with standard notebook design; you write, scan the content, and then erase the page. The pages (and the notebook itself) are virtually indestructible. They are made of polyester, which is why they have such a smooth surface that can be wiped with damp cloth. Once you scan the page, you can immediately send it to your cloud, email, and so forth. Note that each page also has seven symbols, allowing you to attach each symbol with various cloud service providers (Google Docs, Dropbox, iCloud, etc.) We recommend this notebook to students (especially science students), engineers and business owners. If you liked it, note that the size Letter is a bit more expensive and wider (larger) than the size Executive. There is one problem with Rocketbook Reusable Notebook that we must mention; Frixion pens that aren't red, blue or black work inconsistently. Moleskine's Smart Writing Set Notebook with Smart Pen is a creation imbued with ambition, but certain flaws in execution prevent it from reaching its full potential. The features are plentiful in this smart notebook. You can use it for taking down notes, archiving them, and keeping them neatly organized by using tags. This item will also record your strokes, and if you are so inclined, you can pair them up real-time audio. When the time comes for you to review your notes, you can make use of the replay feature included in this Moleskine creation. The editing and highlighting features will also make the review process much easier. Unlike many of the smart notebooks currently available, the app paired up with this smart notebook works as expected. The features that require the app work well, and they won't add to your working time. The big issue with this item is the smart pen included. It simply is not a helpful tool. You will have to position your hand at an awkward angle if you want the pen to work properly. There are also times when it just will not work. Had the designers put more time into creating a better smart pen, this whole set would have been much better. 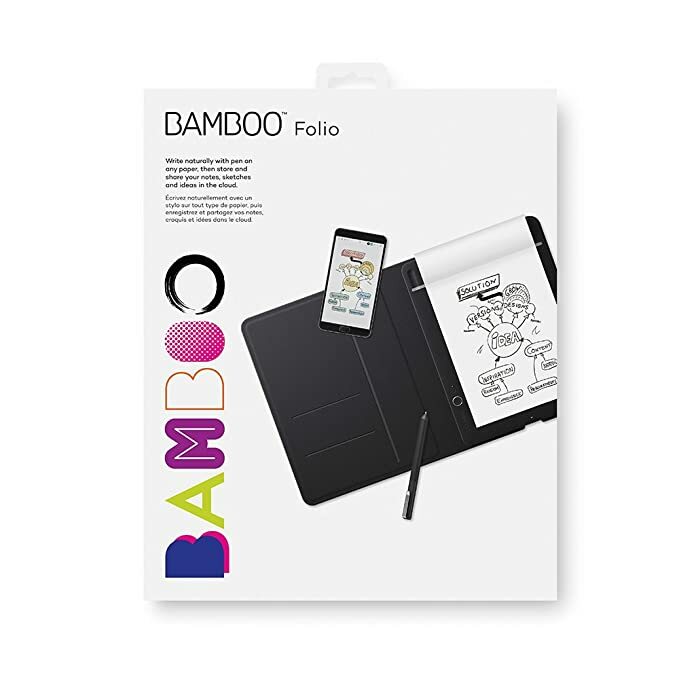 Considering that they were made by the same company, it should come as no surprise that the Bamboo Folio Digital Notebook from Wacom shares more than a few things in common with the Bamboo Slate. In terms of software, they come equipped with many of the same features and functions. That's both a good and bad thing. 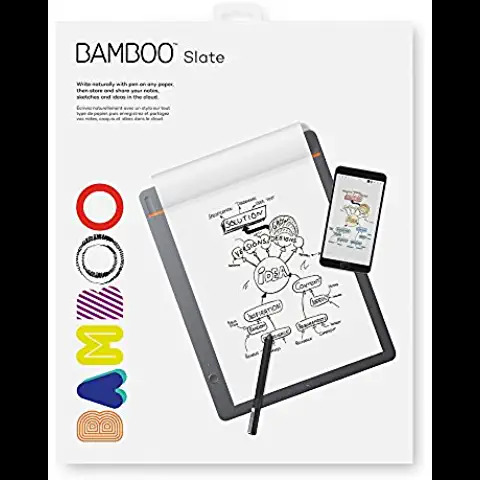 You'll appreciate that you can still quickly save your notes and be able to organize them with minimal effort, but that also means that the same connectivity issues that plagued the Bamboo Slate have returned. The two Wacom products do vary quite a bit in terms of hardware however. Thickness is still the same, but the inclusion of an important accessory significantly differentiates the Folio from the Slate.. The difference comes from the inclusion of the foldable flap. Yes, it's just a protective case for the smart notebook, but it comes in handy quite often. If you're in the middle of taking notes but suddenly have to run off somewhere, you can keep the notebook safe inside the case and put it in your bag. There are also slots included that can be used for the purposes of keeping business cards. A small addition really ends up making a huge difference with this smart notebook. The end result is a smart notebook that is very convenient to use. Elfibook has two notebooks to offer: the older A5 version and the new (2018) B5 version. But regardless of which version you go for, you'll acquire yourself an extremely durable, efficient and versatile item. 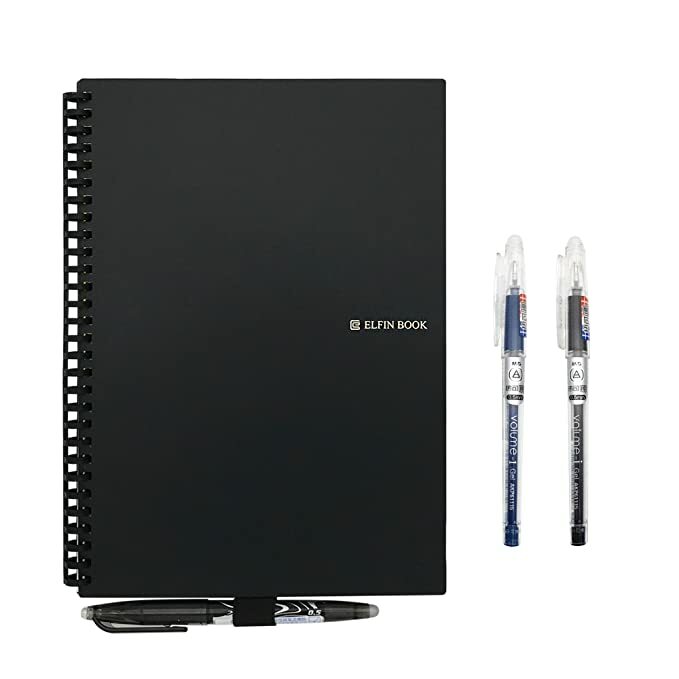 Each Elfinbook notebook is waterproof, reliable and reusable. You have 100 pages at your disposal (50 double-sided), and you can use each page roughly 500 times. So, if you are looking for cost-efficiency, Elfibook could be the item for your needs. 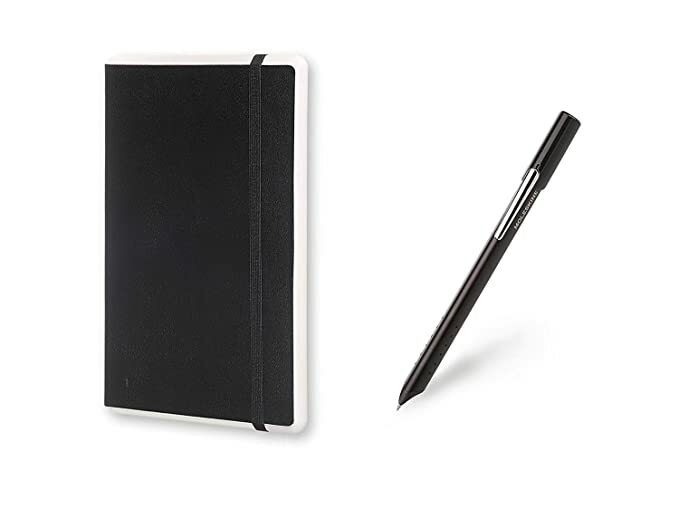 This notebook is compatible with its native app, Elfinbook APP. 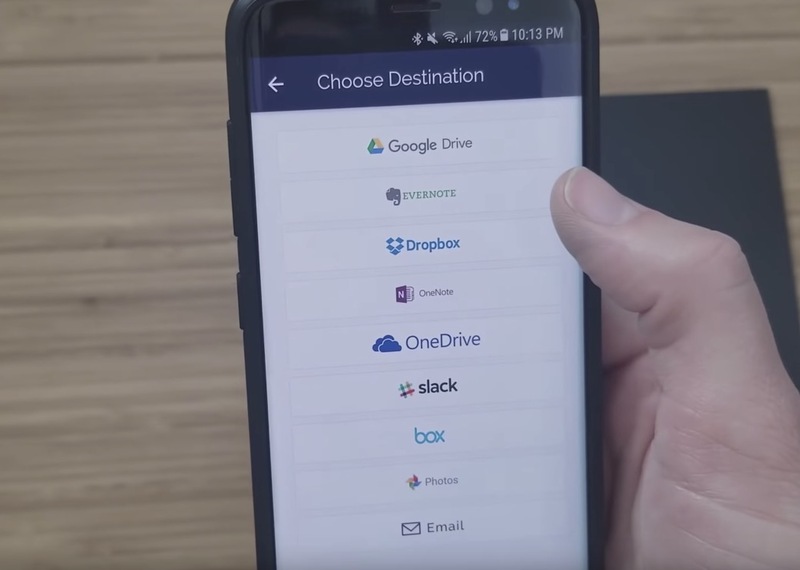 Whether you use an Android or iOS, you'll be able to scan and store your content and transfer it to cloud. 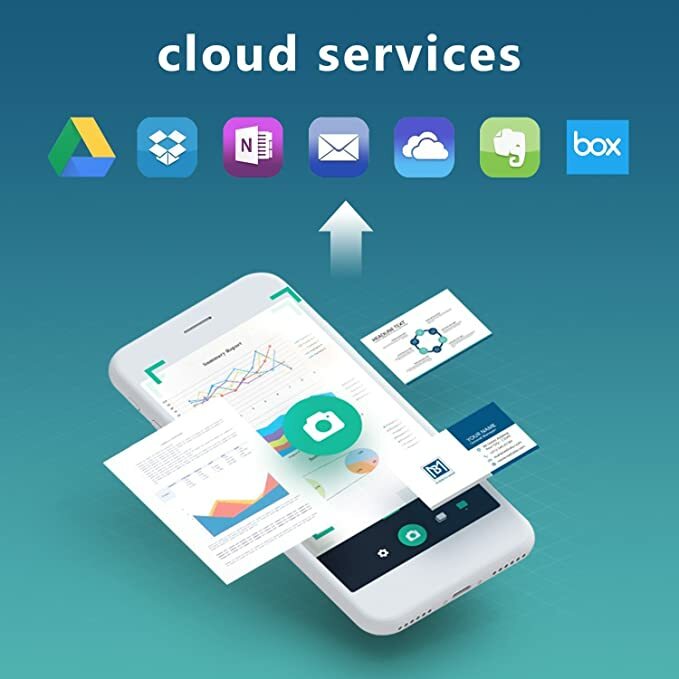 The app will offer you a wide range of cloud service providers, including Google Drive, Dropbox, Baidu, etc. You can manipulate stored data, shuffle it around, rename, organize and delete. Anyone whose job requires creativity can benefit from this notebook due to its reusability. And, you can even disassemble it as you please, share pages in your office, inspire creativity and be environmental at the same time. If you opt for A5 type, you'll receive three Gel-Pens. These pens are suitable for writing and drawing. And if you go for B5, you'll receive new Hot Clean pens that are slightly more efficient and dry faster than the Gel-Pens. Pens aside, you should know (if you didn't already) that an A5 notebook is 5.8 x 8.6 inches large, while the B5 features 6.9 x 9.8-inch sized pages. Some people did complain that the pages do leave small imprints after you erase the content. To be fair, most people treat this notebook as if it is a standard notebook, which is why they don't realize digital notebooks require minimal pressure to register the ink. Whether you bought a smart notebook to use for school or work, you definitely want to be able to use it easily and without having to fuss over different things just to get the results you need. 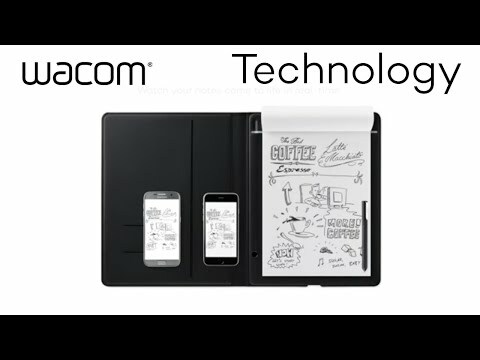 The people over at Wacom are cognizant of that and have designed some smart notebooks that are designed to be very convenient. The Bamboo Slate is one of those smart notebooks. The designers of the Bamboo Slate came up with a smart way to make note-taking a significantly easier task. Given the way it's designed, you can hold it in either hand and begin scribbling right away, After you've jotted down enough notes to fill up a page, you just have to press a button to make sure your work is stored. For the most part, this item recognizes handwriting pretty well, which is a big plus. Being able to use tags to keep notes organized within the compatible Inkspace app also saves you plenty of time that you can now spend doing some other things. You're given 80 pages to work with. That's a decent amount of workspace, but this item would have improved significantly if that number was higher. Unfortunately, some connectivity issues are to be expected when using this smart notebook. Be sure to save frequently to avoid some real headaches. 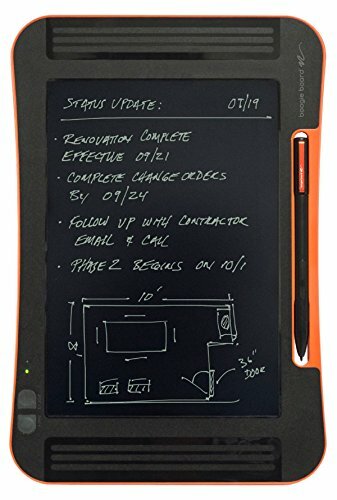 In describing their LCD Writing Tablet, the folks at Boogie Board say it's like an “electronic Etch-A-Sketch.” That description provides a pretty accurate summation of this smart notebook's design and some of its functionalities, but whether or not that's a good thing will depend on your preferences and what you intend to use it for. Let's just say that this writing tablet does not fit in very well within a corporate setting because of the way it has been designed. However, if you're just using it as a student or in more relaxed office environments, then the design should be no issue. You can make use of just about any object with a slightly pointed tip to write on this tablet. Unsurprisingly, it still works best with the stylus included, but the fact that other items can be used to write on it is a nice feature. Once you're done writing notes, you can clear the page with a simple button tap. You can upload your work to Evernote by making use of the syncing app, but you should know that doing so could very well end up being a tedious process. You will have to upload each page of notes one at a time. The good news is that this writing tablet features a long-lasting battery that can allow you to keep working for days without needing to charge. For lengthy school or business trips, this is the smart notebook you will want to bring along. The Homestec notebook is carefully designed and well-crafted and is by far the best reusable notebook for business people. 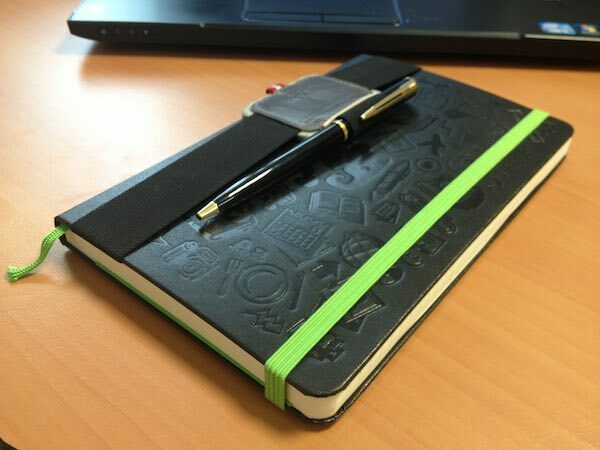 You can choose several types of Homestec notebooks, but we should say that this review focuses mostly on the Black/Green version with leathered covers. If you are looking durability and reliability, you should probably try out this notebook. The paper is smooth but robust, allowing you to reuse a single page up to 500 times. You can erase the pages with a damp cloth, hot air (using a hair drier). You can also delete the ink using a built-in pencil eraser. This notebook features stone paper that keeps its original structure even if it gets wet. And if you opt for notebooks that have PU cover, you'll enjoy maximum security and protection against damage. But even though this notebook is resistant, we suggest that you don't dry it in microwave on maximum power. Also, avoid exposing it to sunlight or other heat-emitting objects. 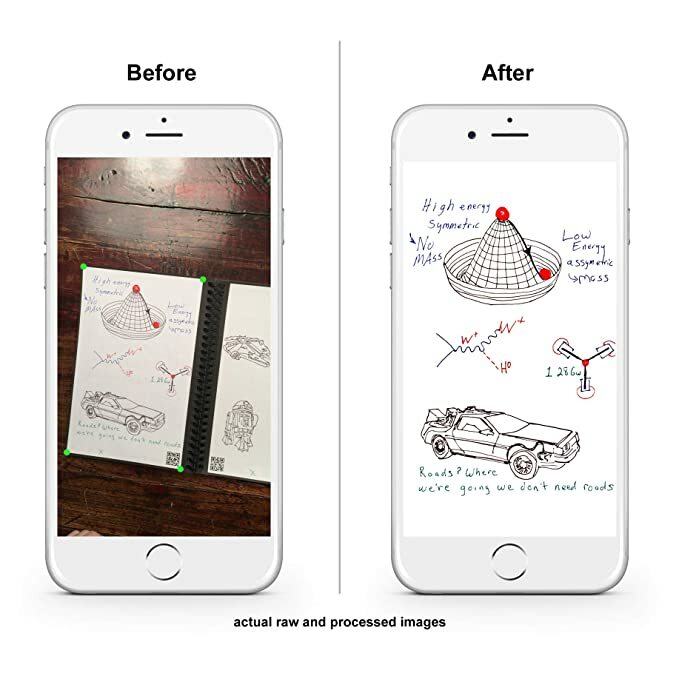 This notebook works with an app called CamScaner. You can use this app to capture the content and then store it as a data in PDF or JPG format. It is also worth noting that HOMESTEC notebooks feature 100 pages; 50 are lined and 50 dotted. So, if your work involves a lot of writing and drawing, consider opting for this notebook. Students, managers, architects, and engineers can benefit a lot from this notebook. The HOMESTEC notebook is a bit expensive, but keep in mind that you'll also receive a compatible pen and a protective cover against external damage. 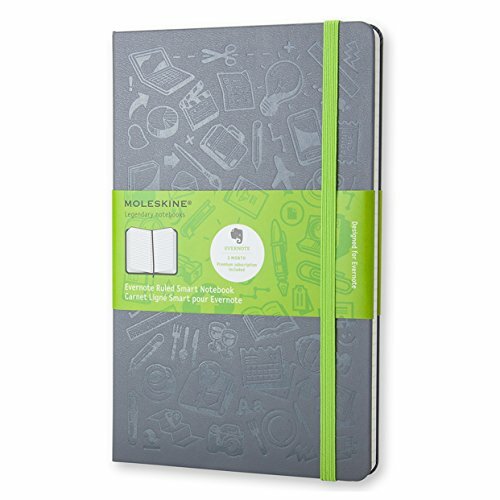 The Moleskine notebook (official name is the Evernote Smart Notebook) is compact, resistant and quality made. The notebook works with Evernote Page Camera and features lined pages to ensure accurate capturing and more convenient sharing. The ESN notebook features dotted lines, which helps your smartphone camera to capture the page digitally and without any disturbances. You also have something called Smart Tagging, allowing you to organize and synchronize your digital and non-digital work in an efficient manner. The notebook itself is very well made. It features protective hard cover and rounded corners to make it more comfortable and reliable to work with. 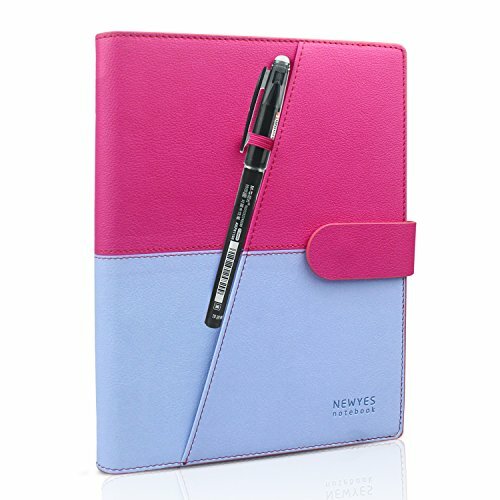 The closer is elastic and flexible and should allow you to open and close your notebook quickly. The Evernote notebook also features an expandable inner pocket that you can use for storing pencils, cloth, erasers and what not. We should also point out that the Evernote app allows you to organize and search your documents efficiently and productively. For instance, you can search data via keywords and thus significantly reduce the time you spent searching for "that one thing." The bad news is that you don't receive a compatible pencil with this notebook. The hardcover is 5 x 8.25, while the sheets themselves are slightly smaller. Due to its size, we can't really recommend this product to designers or architects. But, if your work or activity requires a lot of writing, consider opting for this notebook. When you are buying a pen, make sure that you buy only those that are officially compatible with Moleskine S.p.A.products; better yet, it is best if you buy the Moleskine official pen. 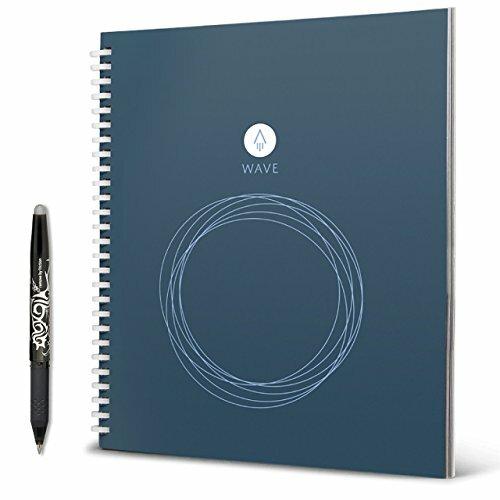 The Rocketbook Wave notebook can be purchased in standard (8.5 x 9.5) and executive size (6x8.8 inches) and with or without a pen station. While it does offer various design and functional benefits, the Rocketbook Wave notebook doesn't provide as much reusability as some other units on our list. 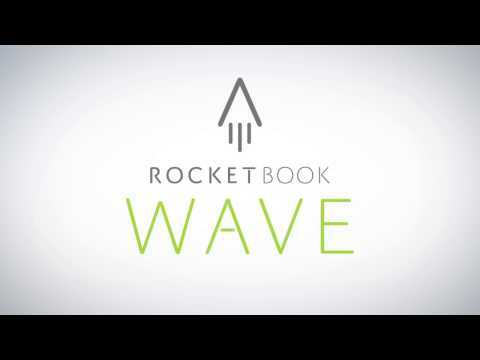 The Rocketbook Wave paper is soft, smooth and fat. It is excellent for drawing lines and geometrical shapes, which is why we would suggest it to architects and engineers. The notebook also features spiral and elastic Polypropylene binding to keep the notebook together. You can erase this notebook in a microwave, each page up to 5 times. With this notebook, you'll also enjoy the Rocketbook app. Like with our previous Rocketbook notebook, this one also features symbols at the bottom of the page, symbols that you can pair with a specific cloud service provider. We should also point out that the paper is free of acids and that it is resistant to water. You can erase the pages as you would erase any other notebook, but if you want a complete wipe, heat it in the microwave, and you'll have a fresh new notebook with empty pages! Regarding microwave erasing: each Rocketbook Wave notebook features a thermo logo on the front cover. But when you put the notebook in a microwave, the blue logo will start fading; when the logo disappears completely, you'll know when to turn off the microwave and reuse the notebook. You can buy Velle notebook in 4 colors, in A5 or B5 size. The product comes with Pilot Frixion pen that adheres nicely to fine-grain paper. You can erase pages up to 500 times using a piece of damp cloth or paper towel. 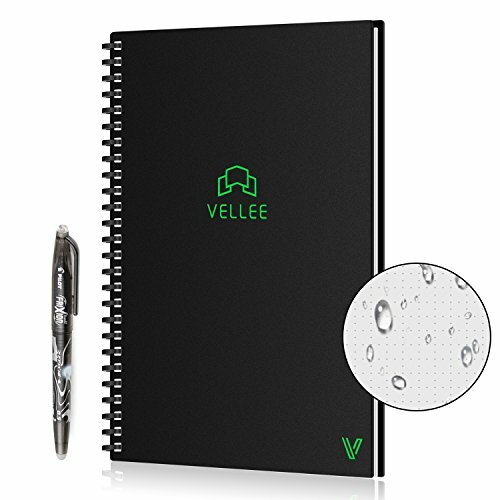 Velle notebook is lightweight, compact and designed for note-takers, students, writers, and engineers. It is the most inexpensive item on our list and also the only item that features three types of paper: dotted lines (or grid), wide-ruled and good old blank paper. 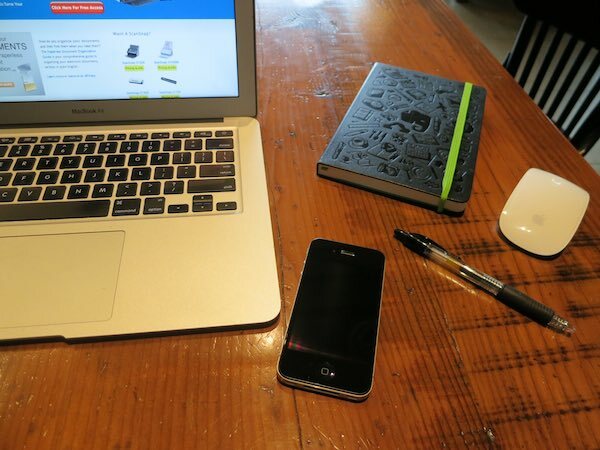 This notebook works with CamScanner for both Android and iOS users. Everything you capture can instantly be shipped to your could and saved in PDF or JPG format. In total, you have 96 pages (32 of each page type), which is more than enough to meet the needs of various notebook users. Because this notebook has fragile covers you should avoid exposing the notebook to sunshine. While it is true that all smart notebooks must avoid exposure to intense light (like sunlight), those with thin covers (like Velle notebook) must be particularly cautious about this. 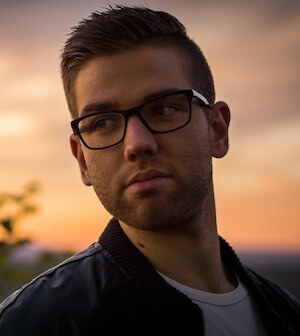 Anyone looking for a budget alternative to a traditional notebook should definitely try the Velle notebook; it is inexpensive, reusable, and it features three types of pages. And the paper is of premium quality, allowing smooth writing and drawing. But keep in mind that this notebook is a bit more fragile than others from our list. This segment of our article is dedicated to people would want to learn more about digital notebooks, their use, cost-effectiveness and so forth. Also, if you are interested in buying one of these notebooks but can't decide which one is the best for your, stay with us and we'll help you pick the best item. But before you erase the page, you capture the content with your tablet or smartphone. All notebooks on our list have a compatible app that you can use to efficiently and rapidly share, store and modify your content. When you finish with your project, use a damp piece of cloth, hair drier or a microwave (depending on your notebook) to erase the page (or entire notebook) and start all over again. The second reason why these notebooks are smart is that of their relationship with the application. Each notebook has its own app with which you can control your data, store it on a cloud, share, outsource, etc. Smart notebooks were designed in such a way that their surface and format doesn't intervene in the capturing process. This ensures that you can always document your work adequately and conveniently without spending too much time on camera adjusting. First, there are non-selfish, environmental benefits. We all know that notebooks are made mostly of trees. So, by using reusable notebooks, we reduce the demand for notebooks, which means that their production will also decrease. Productivity - These notebooks can increase your productivity because they allow you to capture and store your data rapidly. 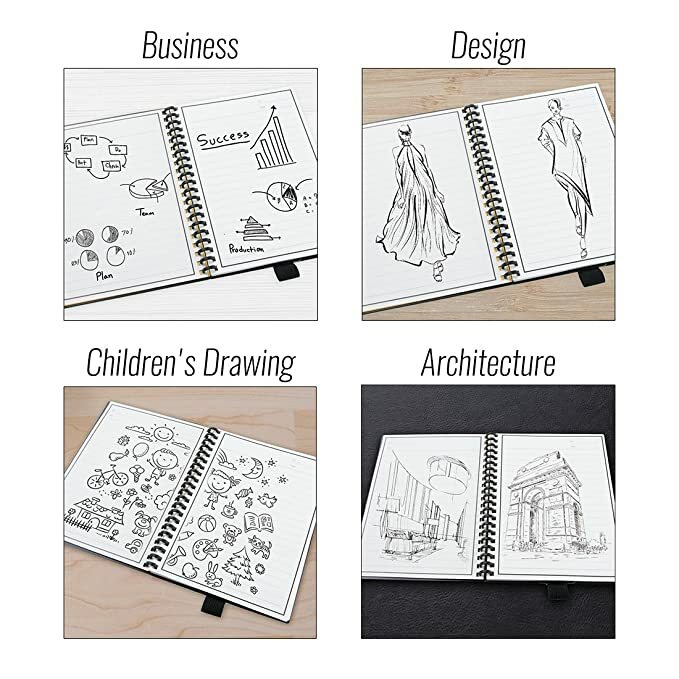 Versatility - Some notebooks feature two or three types of pages, allowing you to draw, write, design at the same time. Durability - Smart notebooks are much more durable and resistant than traditional notebooks, especially if they have a protective cover. Creativity - Smart notebooks inspire sharing, dialogue and out of the box thinking. Utilize the strength of this notebook to create with more freedom and comfort. Do You Need A Smart Notebook? Do you need a notebook? If you do, then yes, you should at least experiment with reusable notebooks. Why? Well whether you are student, manager or engineer, it is always nice when you can save money on your material. The idea that you can write in a notebook, capture the data, transfer it to a cloud and organize it efficiently is remarkable in itself. This allows students to organize their classes better and prepare for exams. Architects and designers may also use this notebook to design sketches or blueprints and store it on the cloud. Artists and writers should also carry one of these notebooks around so that inspiration never misses them. And if you are a business person, we suggest you bring a small notebook with you to articulate your thoughts and plan your business. Notebook size is a matter of preference. If you need a reusable notebook for writing occasional notes and drawing simple sketches, then go with the A5 sizes. Students could also opt for A5 size because it is generally less expensive than the B5. If you need compactness (to store notebook in a smaller bag), go for A5. But, if you need a notebook for serious work that includes designing or drawing, then you should go with B5. What you must realize is that this isn't a good and better situation and that we can't categorically decide which is better. Instead, this is something you alone must figure out, and then select the size based on your assumptions. Dot Grid, Lines Or Blank? 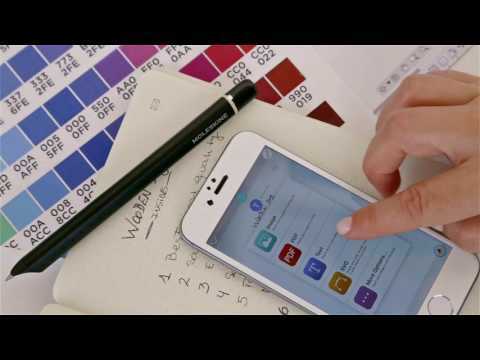 Most notebooks feature a dot grid page pattern to ensure that a smartphone can easily capture the content. Dot grid pattern is also nice for drawing lines, diagrams, writing statistics and drawing blueprints. If you are a student, engineer or an architect, you'll probably benefit the most from using grid dot pattern. Artists and designers should probably go with blank pages. Again, this is also a matter of preference, but we feel that artists and designers need more liberty in their expression. Writers, managers and note takers could try the wide-ruled paper (the one with straight uninterrupted lines). So, if you need colors, buy only those notebooks that support and offer pencils in various colors. The good news is that the pencils aren't expensive and that most manufacturers produce quality and durable items that adhere and dry rapidly. What Is The Best Erasing Method? We suggest that you go with notebooks that are highly reusable (500 times). Also, you should know that some manufacturers include a piece of cloth in their packages, thus ensuring that you use a proper fabric for erasing. Alternatively, you can use pencils with built-in erasers and erase the content. Another thing you need to consider is the size (A5 or B5), and whether or not you need thin or thick covers. Alas, make sure that you are happy with the app and that your smartphone/tablet can use it. There are of course other things you need to consider (price, design, format), but make sure that you first focus on those that are critical. Even though smart notebooks aren't as smart as your laptops or iPads, they are much smarter than your traditional paper notebooks. Artists, designers, students, architects, managers, engineers and all others that use notebooks should seriously consider switching to reusable notebooks for commercial and personal reasons. If you decide to grab one of these items for yourself or as a gift, make sure that you choose according to the factors we outlined in our buyer's guide. If you do that, there's no doubt that your choice will be not only but also fine-tailored for you and your needs!